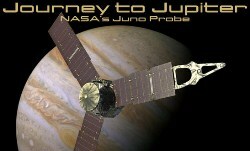 Recently, on August 5, 2011, NASA launched a new space probe, called Juno, headed towards Jupiter. When it reaches its destination the spacecraft will be placed in a polar orbit in order to study the planet’s composition, gravity field, magnetic field, polar magnetosphere, and the deep winds of its atmosphere. Clues about Jupiter’s formation will also be researched. 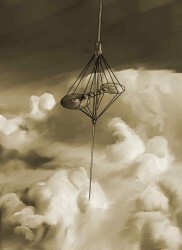 The spacecraft’s name comes from Greco-Roman mythology. The god Jupiter drew a veil of clouds around himself to hide his mischief, but his wife, the goddess Juno, was able to peer through the clouds and see Jupiter’s true nature. [reference] In my opinion, this is a very appropriate name, since the spacecraft will physically peer through the clouds of planet Jupiter and thus learn its secrets. It’s hard to comprehend the distances involved. I wonder how long it will be before there is a manned mission to Mars? As for Mars, hopefully NASA will be able to keep it’s time-table, which would put a manned mission to the Red Planet around the 2040s. The strength and size of Jupiter’s magnetosphere is amazing. I have strong suspicions that it may interact with Saturn’s rings depending upon their planetary positions. I’m wondering how close Saturn is to the magnetosphere of Jupiter now. Do you have any idea? Thanks for sharing the infographic! Yes, it has been discovered that Jupiter’s magnetic field extends beyond Saturn’s orbit. However this field has an elongated shape, instead of spherical, due to the solar wind pushing on it. So this means that for Saturn to get inside Jupiter’s magnetic field, it has to be perfectly aligned right behind Jupiter. Unfortunately such occurrences are quite rare due to the slow orbital speeds of both planets. When it does happen however it would only affect ring particles that can conduct electricity, and it has been discovered by the Cassini probe and it’s predecessors (such as Voyager and Pioneer) that Saturn’s rings are mostly made of ice particles of various sizes. Thanks for responding. I know it happens rarely and if I remember correctly the cycle is about once ever 22 years or so. The other curious alignment is when Saturn is exactly on the opposite side of the Sun from Jupiter – and keep in mind I’m speaking of the possible implications of magnetic interactions, so even though we are talking about particles, they are highly energizes particles. In my theory, Saturn is either directly behind OR directly opposing Jupiter in 11 year cycles. 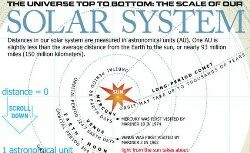 Which strangely corresponds to the mysterious 11 year solar cycles that are also closely related to magnetic reactions. I used to track these planetary positions with a program called Celestia but I haven’t had a look at it recently – since I spend so much time blogging these days – but it’s something that’s always in the back of my mind. And I knew that 2011 and 2012 would be a time of strange weather activity here on Earth due to the alignments of Jupiter and Saturn. Seeing your blog always gets me thinking about these theories and I really appreciate you for keeping me in the loop (pun intended). It’s a fact that large planets such as Jupiter and Saturn interact gravitationally and through their respective magnetic fields, but this effect on smaller and more distant planets (such as the Earth) is minimal. However this effect over millions of years can become significant and result in minor changes in orbits of the planets of the solar system.